The YouTube mobile app has shortcomings, which explains why there are a lot of third party apps online. Software developer DJiT has joined the fray with Stream, and it lets you play videos via a floating window. This allows you to multitask, but Stream has many more noteworthy features. The main screen shows the most popular music videos on YouTube while Radios and Genres let you narrow the field down even more. Radio is divided into categories like concentration, workout, etc. The Genres of course, include rock, hip hop, country, jazz, R&B and so on. Just tap the one you’re interested in. When you choose a video, it plays in a window which you can resize and drag. If you want to close the player, drag it down until a cross sign appears. 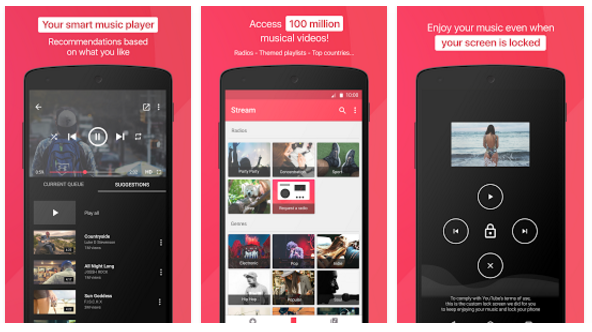 The biggest draw of Stream is it lets you play music videos while running other apps. Many just download this app for that purpose, but it also has a nice search filter that lets you choose the music you like. Once you’ve find a video, tap to play it. Stream also lets you create and import playlists. There is also an option to stream data only if there is a Wi-Fi connection, saving you data. There are a lot of YouTube mobile apps, but Stream is a cut above the rest thanks to its many useful features. Now you don’t have to put what you’re doing on hold just to listen to your favorite songs. If it’s on YouTube, you can play it here.